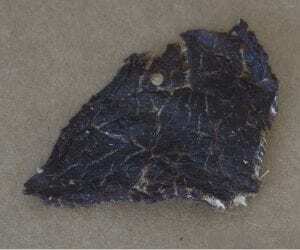 Home made jerky: What is means to "cut against the grain"
Home » Home made jerky: Cut with or against the grain? Home made jerky: Cut with or against the grain? We’ve all heard discussions about cutting meat “with or against the grain”. Normally this is in the context of steak, or in Australia, carving up the lamb roast! But, unless you had expert tuition in your younger days, it can all get a bit confusing. We hope this small page can help you with your jerky, and maybe understand the concept in a broader context as well. This is an explanation of what “cutting with/against the grain” actually means, and what the end results are. Here we go! Pictured here is a large topside that has been trimmed of all fat (note: “Top round” in the USA). You can see the “grain” of the meat running left-right across the page, in the same direction of the knife blade. These are the meat fibres. If we cut the meat “with the grain” the blade follows the natural lines of the meat. 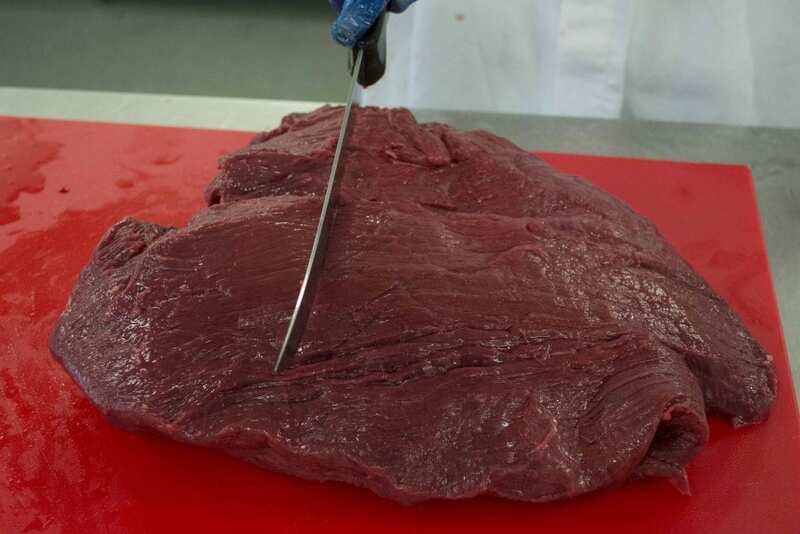 Visualise the knife blad cutting through the meat – no fibres will be cut, so these fibres are still intact once the meat is sliced, giving those slices strength. Imagine biting into it. Your teeth will be cutting against the direction of the grain. 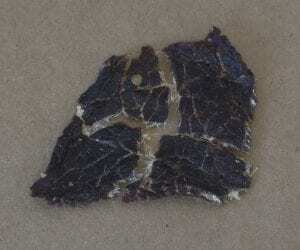 The fibres will be more difficult to bite through, and the jerky will be harder to chew. This suits some products, but not others. Sometimes we want to have something that is a bit more work to chew. We had one person comment that he likes to make chilli jerky cut with the grain so that his friends suffer longer when chewing it! KOOEE! jerky is actually cut against the grain, so your teeth are biting in the same direction as the grain. Our jerky is for people on the move, so we wanted to create a slightly softer texture. Keep reading to see how we do it. The opposite applies when cutting against the grain. If you cut through all the meat fibres when slicing the raw meat, you’re going to have a much easier time when eating the final jerky. This is why steak should always be cut against the grain. In fact, whilst on a 6 month journey to create the world’s best beef burger, Heston Blumenthal discovered how important it was to cut his meat patty against the grain (resulting in a melt-in-your-mouth experience). Below is some KOOEE! jerky that was cut against the grain. It was very easy for us to pull this apart, because the fibres of the meat are actually running into the page. 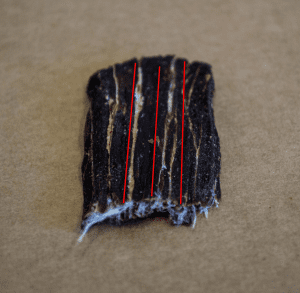 Jerky cut against the grain is easier to tear in any direction. For jerky, this is a matter of preference. KOOEE! jerky is always cut against the grain, just like any well prepared steak. But, we expect our product to be eaten on the move. There are some occasions where having a chewy jerky would be totally acceptable – a fishing trip, beers infront of the TV, punishing your friends with a super hot chilli, etc.